As always at Blue Spring State Park, and Valentine Park where the annual festival is held, we all prepare for any type of weather at the end of January. Usually we are bundled up to our noses because of the cold, but this year was a welcome respite. 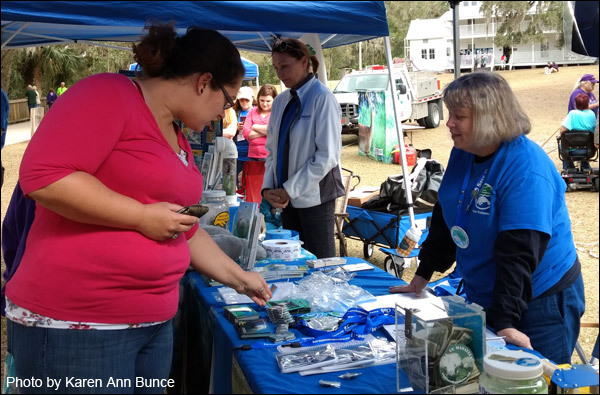 Save the Manatee Club Volunteer Deb Brown (right in photo) explains some of the fun manatee “swag” on the table. Saturday was quite pleasant and everyone enjoyed it. Overall festival attendance seemed to be down a bit, but visitors more than made up for it by their enthusiasm. We had a steady stream of people who kept our volunteers busy answering questions, and attendees participated in our donation draw for a beautiful manatee statue or a cuddly plush toy (the drawing for those will be in February). Manatee Specialist Wayne Hartley gave us a list of Save the Manatee Club manatee adoptees who were seen in the spring run that day, and they were very popular because people could see the manatee they were adopting if they looked closely and compared scar patterns. We think we may have even broken a record for adoptions in one day at Blue Spring! The manatees in the run obliged us by making sure some of them were available to view all day, as if they seemed to know the weekend was all about them. 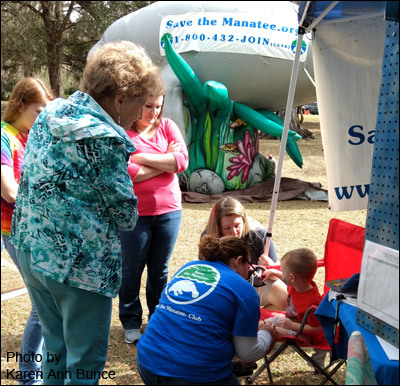 Save the Manatee Club volunteer Mina Reale (middle of photo) enjoys rounding up the youngsters for face painting at the park. Hope, our indomitable inflatable manatee, stood up proudly and was a beacon for manatees as she provided a backdrop for pictures for visitors. Not even unexpected gusts of wind rattled her flippers! Also popular was the “face-in-hole” manatee cutout for great visitor photo opps. The rangers and staff at the park were helpful as they always are, and we are forever grateful to them for looking after our precious manatees. Volunteer Coordinator’s Note: This year’s Volunteer Team at the state park included Debra and Doug Brown, Karen Ann Bunce, Laura Frenchik, Donna Snyder, Frances Dutton, Karen Michaels, Mina Reale, Heather Murphy, Will Bracken, Janice and Terry Nearing, Aimee Krivan, Janneke Bogyo, Sue Carey Lindholm, Kelly Hodoval and Leo. The Volunteer Team at Valentine Park included Cora Berchem, Melissa Sunshine, Jozette Spina, Sandra Boyd, Sue Martin, Kelly Miller, and David Herbert. 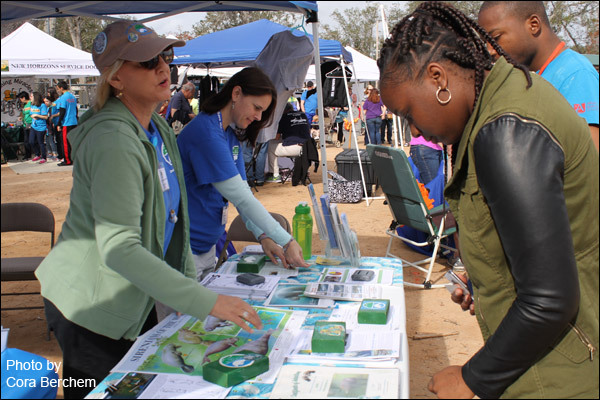 Visitors learn about manatees from Save the Manatee Club volunteers Melissa Sunshine and Kelly Miller (left to right in photo) at the Club’s education table at Valentine Park, site of the Blue Spring Manatee Festival.